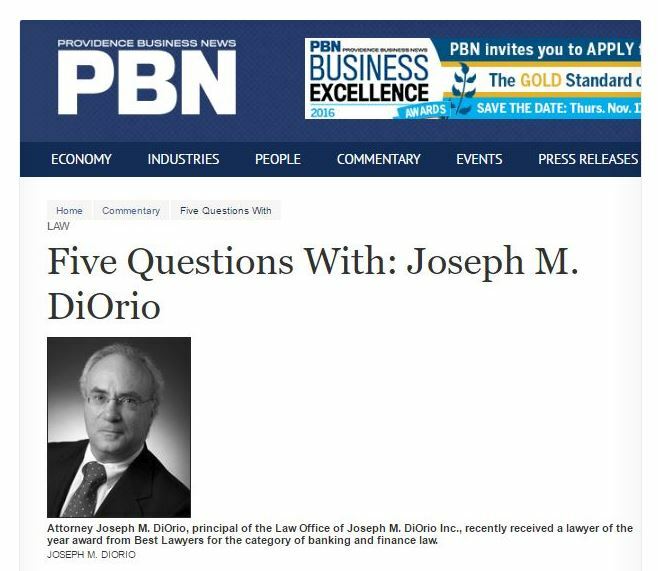 Attorney Joseph M. DiOrio, principal of the Law Office of Joseph M. DiOrio Inc., recently received a lawyer of the year award from Best Lawyers for the category of banking and finance law. DiOrio talked with Providence Business News about why he received the award, how he got into banking and finance law and what trends he’s seeing in Rhode Island. PBN: Congratulations on your award. Why did you receive it? DIORIO: I am very honored to receive this recognition. I am fortunate to handle a wide variety of commercial legal transactions in the banking and finance arena. Based on a peer-review process, Best Lawyers bestows this recognition annually to a single lawyer in each practice and major metropolitan area. PBN: What is your professional background and how did you get involved in commercial banking and finance law? DIORIO: I started as a law clerk and then was hired as an associate at a firm called Tobin & Silverstein where I had the opportunity to work with financial institutions right at the start of my career. I was extremely lucky to work with and learn from distinguished lawyers like Bentley Tobin (deceased), Judge Michael A. Silverstein, Merrill Sherman and others. As my career progressed, I represented lenders in many areas including financings, workouts, foreclosures and insolvency proceedings. PBN: What trends are you seeing in the world of banking and finance law? DIORIO: My sense is that lending, in general, is picking up although Rhode Island may be a bit behind Massachusetts and Connecticut. Lending to non-profit entities appears strong. The marketplace for commercial lending seems pretty competitive with larger and smaller banks competing for deals. Workouts, foreclosures and commercial bankruptcies are generally down. PBN: How does Rhode Island differ from neighboring states and other regions of the country? DIORIO: Our recovery in Rhode Island appears to have started a bit later than, say, Massachusetts, but there seems to be increasing activity here. Commercial real estate development lending here is slower than Massachusetts. In Rhode Island we have a number of strong, active banks, both large and national in scope as well as small and community-based. For borrowers, there is an excellent choice of savvy bankers to ensure the right fit. PBN: From a bankruptcy and foreclosure point of view, how would you compare the Rhode Island market today with the height of the Great Recession? DIORIO: From a bankruptcy/foreclosure perspective, we are seeing a lot fewer commercial real estate foreclosures, receiverships and bankruptcies. Lenders were likely very cautious when making loans in 2009, 2010 and 2011. Those foreclosures, or trustees or receivers sales that do take place have sometimes resulted in successful sales and opportunities for the buyers. In the right situation, having an active commercial lending environment can lead to a successful result, whether it be a sale or refinance. See full article here in PBN.